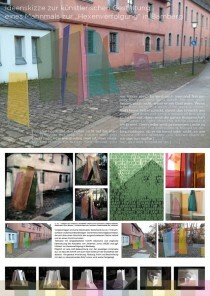 Art competition for a Mandela memorial in Nuremberg. 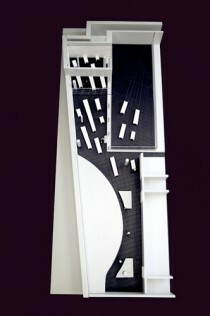 The proposal refers to an important part of Mandela’s biography and transforms it into a sculptural space. It reminds of peaceful moments and notions of freedom during his 27 years of incarceration. The RIVER > SIGNS work as leafs of a lock gate, looking glasses, illuminations and image screens inside of the uncomely underpasses which passersby have to cross when moving in the center of Mühlheim an der Ruhr. They are super-signs. Art competition for redesigning the windows of the former church of Dominican monastery (today’s auditorium of University of Bamberg). Grids and color were the chosen core elements for connecting the historic reference with the contemporary use of this space. Perspective implies a specific position. The visual focus, from which you are looking at something determines the field of vision you can perceive. These are simple yet fundamental thoughts which are very meaningful for all members of the German Bundestag.